“Kelly is primarily known for his day job in the legendary band Neurosis, as well as in acts like Shrinebuilder, Mirrors for Psychic Warfare, Corrections House,Tribes of Neurot, Blood & Time, etc. Thankfully, I was hip to the stripped down, minimalist music he creates alone, as well. The profoundly poignant content he manifests as an individual, or within the set up as Scott Kelly & The Road Home, is a soul-searing testament to his earnest talent. As for the people in attendance, the significance of our collective, communal-like experience was evident. Complete silence hung like a haze during these songs. No one dared utter a word as we stood transfixed, only applauding as each came to an end. 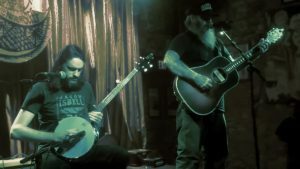 – Pat “Riot” Whitaker, RiffRelevant.com on Scott and John’s live performance in Asheville, August 12th, 2017. To get a more in-depth look on Scott and John’s performance, please see the full live review here.